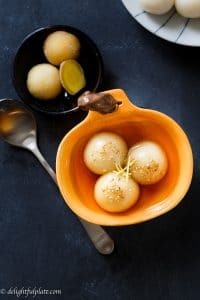 Vietnamese Glutinous Rice Balls (Che troi nuoc) are filled with mung bean paste and bathed in the fragrant and sweet ginger syrup. 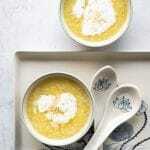 This warm dessert is very fulfilling and comforting. 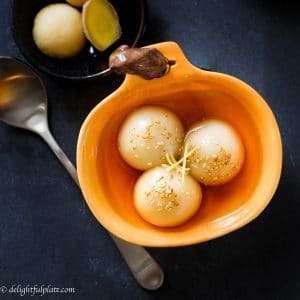 Growing up in Vietnam, I got to eat and love many warm desserts, like che chuoi (banana tapioca pudding) or this glutinous rice balls/dumplings in ginger syrup. 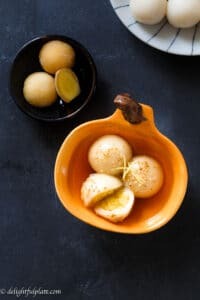 In Vietnam, we call this dessert “che troi nuoc“. The name is derived from the fact that the rice balls/dumplings will float to the surface when cooked through. It’s difficult to find an equivalent name in English, so you can call it glutinous dumplings, glutinous rice balls, sticky rice balls or whatever you like :). The skin of the rice balls is glutinous rice flour and it has an addictive soft-chewy texture. The filling is creamy mung bean paste which is slightly sweet. 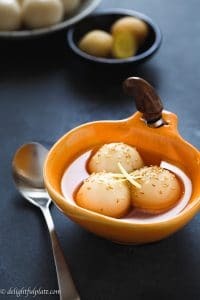 The combination of the rice balls and the ginger syrup is pure heaven on cool fall days or cold winter days. We usually sprinkle sesame seeds or chopped peanuts over it to add a nutty flavor and increase the deliciousness of che troi nuoc. 1. Choose the glutinous rice flour (sweet rice flour, sticky rice flour) which is made from grinding glutinous rice with water. 2. Soak mung bean for a few hours will shorten the cooking time. 3. Gently and slowly wrap the dough tightly around the filling. Avoid letting air pockets between the dough and filling, because the air pockets can make the dumplings break when we cook them. 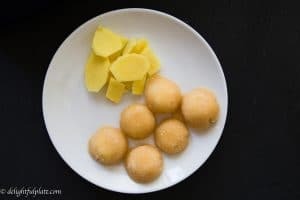 To make Vietnamese glutinous rice balls, you need glutinous rice flour, mung bean, shredded coconut (optional), coconut milk and regular sugar. Apparently, there are two types (at least as far as I know) of glutinous rice flour. The first type is made from grinding sticky rice finely with water. Vietnamese or Thai glutinous rice flour sold in Asian grocery store is this type, and it is the best for making these dumplings. The second type is made from grinding just sticky rice, for example, Japanese mochiko flour belongs to this category. If you make these dumplings with this flour, the end product is not as soft as using the first type. Therefore, please check to make sure you purchase the right flour. The ingredient list of the flour should say glutinous rice and water only. For your reference, this is the glutinous rice flour brand I usually buy. The ginger syrup requires fresh ginger and palm sugar. You can easily tell from its name that palm sugar is made from palm tree. It has a light caramel color, and its sweetness doesn’t feel as sharp as white sugar. Using palm sugar gives the syrup a beautiful golden color which is a little lighter than the color of honey. You can find palm sugar at Asian grocery stores. The first step of making che troi nuoc is to make the filling. 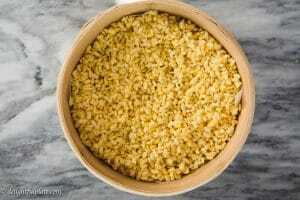 You need to cook the mung bean until it is very soft, and then mash or process finely in a food processor. After that, you mix it with sugar, coconut milk, and coconut to create the mung bean paste. Divide the paste and form into small balls. After you have the filling ready, proceed to making the dough. First, mix glutinous rice flour with lukewarm water. Knead for a couple of minutes, then divide and form small dough balls. You need to gently wrap the dough tightly around the filling and try to avoid creating air pockets as much as you can. Instructions and step-by-step photos are in the recipe below. Next, bring a large pot of water to a boil and drop the balls to the pot. You know they are cooked when they float to the surface. Making the ginger syrup is very easy. You just simmer ginger and palm sugar in a pot of water. You can add one or two knotted pandan leaves to the syrup for more fragrance but it is totally optional. When the syrup is ready, add the glutinous dumplings and simmer for about 5-7 minutes. This step will make the dumplings softer, and the skin will turn from white to a subtle golden hue. Some people like to drizzle some coconut sauce when serving but I don’t think it’s a must. You can make the coconut sauce by simmering coconut milk and adding some tapioca starch (or corn starch) slurry to thicken it to your liking. Vietnamese Glutinous Rice Balls are filled with mung bean paste and bathed in the fragrant and sweet ginger syrup. 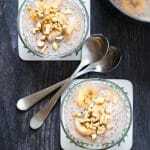 This warm dessert is very fulfilling and comforting. If you have time, soak mung bean in water for 4-6 hours or overnight. You can skip soaking, but you will need to increase cooking time. Wash and drain mung bean. Add salt and mix well. Set up a steamer and steam for about 15 minutes or until mung bean is soft. If you don’t soak the mung bean in advance, steam for longer and add a couple teaspoons of water to the mung bean when steaming. Mash or process mung bean finely in a food processor. In a pan over medium low heat, add olive oil and transfer mung bean to the pan. Add sugar, coconut milk and shredded coconut. Mix well to combine into a mixture which you can squeeze and form balls easily. Use a little over 1/2 tablespoon of filling (tightly packed) to make a ball of filling. You can make about 25 balls. Set aside. Divide the dough into 25 equal pieces. Lightly dust your hands with flour. Roll each piece between your palms to form a small ball of dough. While you work through the dough, cover the portion that hasn’t been used with damp towel to prevent it from drying. Flatten the ball of dough with your hand into a round with 2” – 3” diameter. 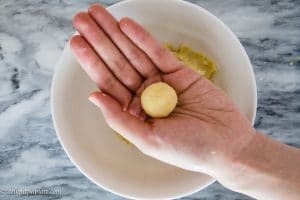 Place a ball of filling in the center, gently wrap the the dough tightly around the filling: use your fingers to stretch and wrap, then pinch the dough at the top to seal it. Roll the ball between your palms to smooth the outside and form round shape. Bring a large pot of water to a boil, then lower heat to medium – medium high. Add rice balls, when they float to the surface, cook for one more minute and then transfer to an ice bath. In a pot, add all ingredients to make the syrup. Bring to a boil then lower heat and simmer until sugar is dissolved and water has been infused with ginger scent. 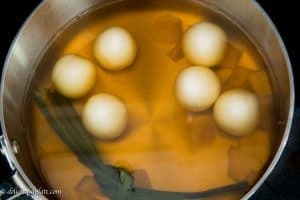 Remove rice balls from ice bath and add them to the pot of ginger syrup. Simmer for 5-7 minutes. 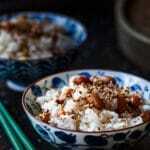 Transfer rice balls to serving bowls, sprinkle sesame seeds, ladle ginger syrup into each bowl and serve hot. Choose the glutinous rice flour which is made from grinding glutinous rice with water. Gently and slowly wrap the dough tightly around the filling. 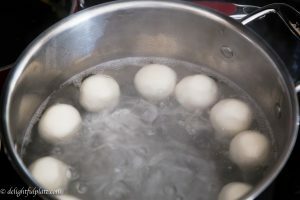 Avoid letting air pockets between the dough and filling, because the air can make the dumplings break when we cook them. thanks for information of this Vietnamese dessert!! I eat it in Vietnam ed I love it! Hi Elisa! It’s great that you tried it in Vietnam and loved it :). Please feel free to let me know how it goes if you decide to make it at home. Thanks! Thank you for your kind words! I’m so happy that you found my post helpful. I admit that I have never thought my recipe would be useful in such a way :). May I ask which resort you are teaching at? Please don’t feel pressured to answer my question though. I’m sure people who are going to attend the glutinous rice dumpling cooking class at the resort will find it very interesting.